Beeches is a Junior school located on a shared site with Infant, Nursery and a Secondary School in the Great Barr area of Birmingham. A 3-form entry school, from years 3 to 6 with various additional learning and break out spaces. The school motto of Aspire, Believe, Strive, Achieve is key in their implementation of ICT in school. Beeches quality of teaching and learning were suffering due to the Interactive Whiteboards and Projectors not being fit for purpose. The problem being that the children could not see the image clearly enough to learn and became disengaged in the lessons. Therefore, the teachers could not use ICT in the classroom. The school also had the prospect of significant ongoing projector replacement costs. We identified and installed a long-term cost effective solution in all areas of the school, removing the barriers to learning. The School were experiencing barriers to teaching and learning due to poor image quality and interactivity on the classroom interactive whiteboards. The whiteboards had been in place for a considerable length of time and had served the school well, however they were nearing the end of their life but most of all the projectors displaying the images on the boards were not of sufficient quality and considerable investment had gone into replacing bulbs and projectors. The school needed to cut the ongoing costs associated with projectors. Upon being approached by the school, we set up a site visit to assess the hardware and met with various members of staff to gain a greater understanding of the problems they faced, the budget available and what the school vision was for using technology as a teaching tool. We recommend Genee Interactive TVs. The screens are modern, fully interactive with a clear image that does not degrade over time, removing the barriers to learning they were experiencing. With this solution, they would no longer need projectors, eliminating their ongoing costs. 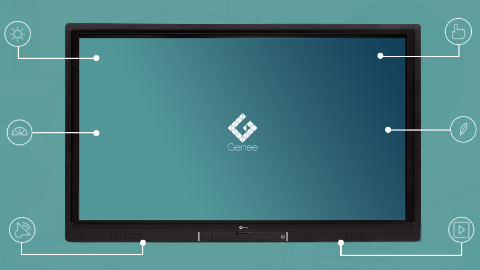 The new Genee TVs came with an onsite repair and replace 5-year warranty, giving the school peace of mind into the future. Our Team of installers removed all the old whiteboards and projectors and installed 15 new Genee TVs including accessories during 1 week in the schools holiday. Each Classroom now has a fully interactive display without the need for projectors, reducing costs into the future. The image is clear and can be seen by the children making learning fun and engaging, allowing teachers to use ICT to help pupils reach their full potential. The new technology has inspired teachers to start re using technology in the classroom and fits well with the school motto.